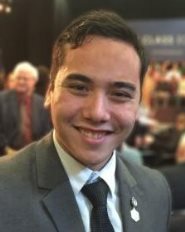 André Zhang Sonera is serving as a Bicentennial Visioning Liaison with the Office of Indiana Lt. Gov. Sue Ellspermann. The Visioning Project is a Bicentennial legacy project focusing on Indiana’s future. The project brought together thought leaders throughout the state to identify “big ideas” for Indiana’s future, which will be compiled into a book that’s expected to be completed this summer. Indiana INTERNnet: What have you been responsible for during your internship with the Indiana Bicentennial Visioning Project? IIN: Describe how this internship is helping you grow as a young professional toward your career goals. AZS: “This internship has provided me the unique experience to gain in-depth knowledge about our state. It is not every day that you have the opportunity to meet and learn from the brightest Hoosier minds as they share their passion and vision for a better Indiana. IIN: What have you learned so far about Indiana? Has anything surprised you? AZS: “Each session is focused on important topics that shape the future of our state. Thanks to the research and data presented by Dr. Breanca Merritt from the IU Public Policy Institute at the beginning of the (first) session, I now have a better understanding of the current and future state of Indiana regarding a variety of important topics. “But my favorite part is hearing the innovative ideas of our experts as they gather together to envision the future of Indiana. At the end of each session, I have a sense of belonging and pride of being an ‘honorary’ Hoosier. See the in the January/February 2016 edition of BizVoice magazine. This entry was posted in Education, History and tagged andre zhang sonera, bicentennial, indiana, indiana internnet, internship by Katie Coffin. Bookmark the permalink.